Liverpool have revealed plans to increase Anfield's capacity from 45,500 to almost 59,000. 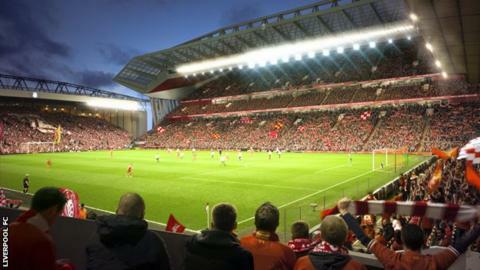 The Main Stand would be expanded to three tiers, while work on the Anfield Road Stand is also proposed. In October 2012, the club said they would redevelop the ground rather than build a new one on nearby Stanley Park. Liverpool managing director Ian Ayre said: "Good progress has been made so far and we are proud to be able to unveil our plans." Part of the proposed redevelopment would result in the memorial to the 96 Liverpool fans who died in the Hillsborough disaster of 1989 moved into the rebuilt Main Stand. If the proposals to expand both stands go ahead, the ground's capacity would increase to 58,800. Local residents raised concerns about any expansion in 2012 because it would involve the demolition of some houses near the ground. The club said that discussions with local property owners were "progressing well" and all parties are close to agreement but added details were still to be finalised. Following a consultation process, the club expects to present its finalised plans and submit a planning application to the city council this summer. If successful, they expect construction to begin early next year with work completed by the start of the 2016-17 season. See the future plans for Anfield.